Motorola has today taken the wraps of a trio of new products, an updated Moto X and Moto G along with a brand-new wearable - the Moto Hint. Plus we've been given a few more details about the elusive Moto 360. Headlining the announcement though is the Moto X, which is simply called the new Moto X - not the Moto X+1 as was originally rumoured. Name aside, Motorola's new flagship looks pretty much like its predecessor, just slightly taller due to the new 5.2-inch, 1080p display. A new metal rim gives that premium finish and makes the whole thing feels super sturdy in the hand. Under the body, which can be customised any way you like thanks to Moto Maker, you'll find the usual array of flagship specs, notably a Snapdragon 801 processor, 2GB of RAM and a choice of 16 or 32GB of internal storage. An updated 13meg snapper is also present, complete with 4K video capture. Software wise you're looking at a pretty much stock build of Android 4.4.4, though Motorola has tweaked it slightly with Moto Display - which shows notifications on the lock screen, Moto Voice for talking to your phone and Moto Assist. Assist changes your phone state depending on your environment, so if you're in a car it'll read out your messages so you don't need to look at the screen. Next up is the Moto G, an update to the, erm, Moto G from 2014, which happens to be Motorola's biggest selling device ever. This time around the screen has been stretched to 5-inches with a 720p resolution, the camera has been upped to 8-megapixels and there's a microSD card slot onboard. You'll need it to as the base model only comes with 8GB internal storage. Dual-sim support comes as standard, which is still rare in the UK, though sadly there's no 4G, which is a bit of a surprise as an update to the original G gave us that super speedy connection. 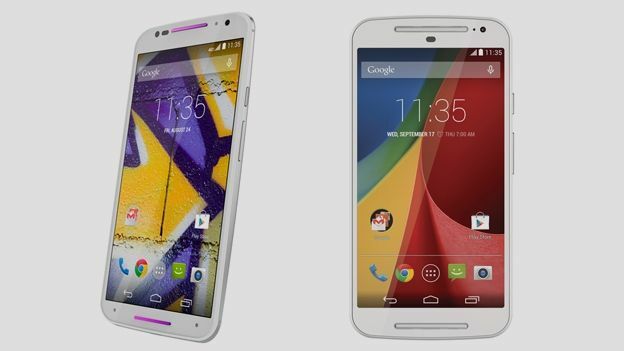 For a bargain £144.99, the Moto G is looking like a stonking bit of kit. Moving away from phones to wearables and the Motorola Hint is a brand new take on the often lamented Bluetooth headset, though considerably smaller. The tiny Bluetooth earbud sits in your ear and delivers notifications and messages right to your brain. Will this be the second coming of the Bluetooth headset? Probably not, but we'll have to wait and see. Finally, Motorola has again shown off its Moto 360 Android Wear toting circular smartwatch, as well as confirming it'll land on these shore sometime in October for £199. The watch, which will charge wirelessly through an included Qi enabled dock, should last about a day on a single charge and Motorola says it has spent a lot of time optimising the display for efficiency. The new Moto G will go on sale from today (Sept 5), for £144.99, while the Moto X will retail for £419.99 off-contract when it lands at the end of September if you're hankering for a Moto 360 it'll be in shops in October for £199. No price or release date was given for the Moto Hint.